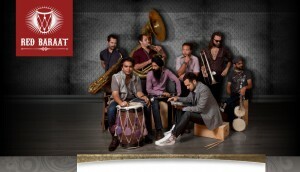 Ben Stapp (tuba); David Smith (trumpet); Justin Wood (alto and tenor saxophones); Sebastian Noelle (guitar); Danny Fischer (drums) + Alex Terrier (soprano saxophone); Curtis Stewart (violin); Andy Hunter (trombone); Amanda Brasher (voice); Isaac Darche (guitar); Martin Vejarano (Cajon). Even though the tuba was a key instrument in earlier jazz years, the shining of its presence became darker as decades passed, although musical formations have always counted on the unique nature of such a corpulent instrument to richen up their pallet of sound possibilities. Tuba player and composer, Ben Stapp is known among the more attentive Portuguese jazz fans for the fact that he resided in our country during 2005 to 2007. Despite his youth, it was clear for the jazz fans that they were facing someone whose obvious talents would allow him to travel towards other ambitious environments. 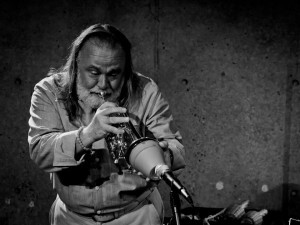 Now living in NY and after an auspicious debut trio album (having as accomplices saxophonist Tony Malaby and multi-percussionist Satoshi Takeishi), Stapp returns with the Zozimos collective, a larger formation that has already crossed many different instrumental configurations and has presented various dimensions of Stapp’s music. Zozimos was a gnostic mystical, alchemist born circa 300 a.C somewhere in the south of Egypt, in a place known in antiquity as Panapolis (today it’s called Akhmim). Stapp relates the alchemy with the maximization of each musical piece’s potential. Besides that, such alchemy also needed, according to the record booklet, an unknown element that one can find in medieval chemistry. Besides being a quoted instrumentalist, Stapp’s art achieves an even deeper relevance through the demanding and multi-resourceful compositional perspectives that he applies within his creations. 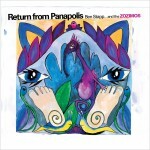 Signing all the pieces as “Return to Panapolis”, written between 2008 to 2011, Stapp establishes a musical potion that has as essential ingredients; mathematical equations of his harmonic theory “Micro-tonal Tonality”, isorhythms, improvisation, rock based elements, electronics and…other harder to define components. The differences are evident when one compares this record with his debut album: the forms that he constructs are longer; there is a wider timbral diversity; there is also a stronger incorporation of the written material and more consistent harmonies. The featured pieces are fertile with details and they change in directions that positively surprise the listener, all the while granting an important space for improvisation. This skilled tension management between composed and improvised parts is, once more, one of the central characteristics of his approach. 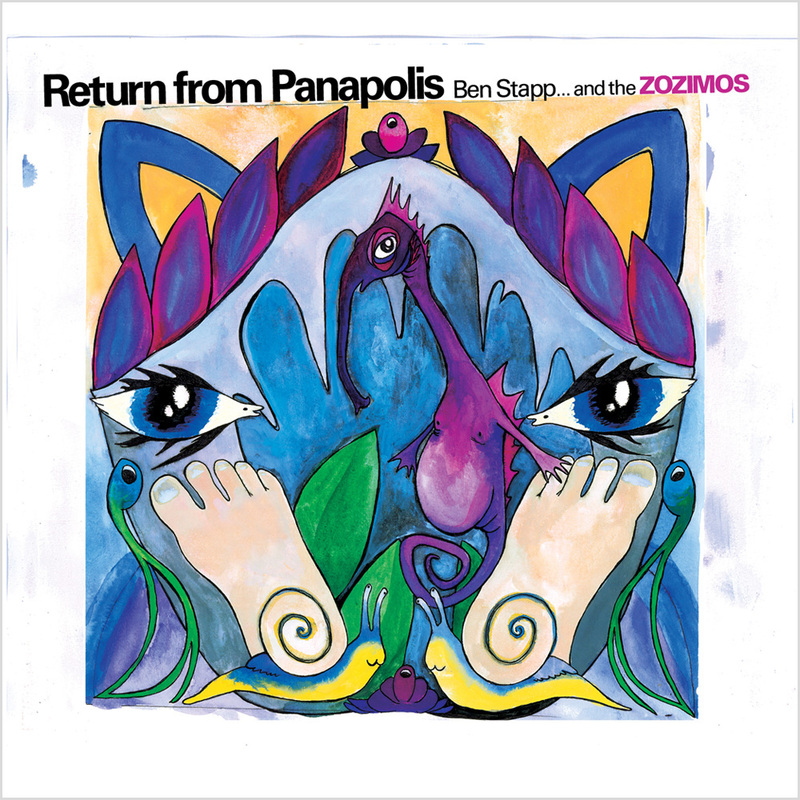 As an instrumentalist, Stapp either assumes the reins of the rhythmical pulsation or the central role in the harmonic and melodic development (listen to “Song of Elias”). The record opens up with a rock energy tune called “Little Creatures Attack”, that offers to the listener a distorted guitar and gaudy woodwinds. The buildings of architect Frank Ghery, inspired the rhythmical complexity of “Ghery, Indiana”. The new version of “Painted Sharks” (a piece which was included in the debut album) is modified with timbral luxuries from which emanate bright solos from Alex Terrier on the soprano saxophone and Andy Hunter on the trombone. Inside the enigmatic atmosphere of “Chia Visits the Moon” comes the assertive trumpet of David Smith. With a more formal structure, “Schultz the Painter” is based on a rhythmic motif inspired by Messiaen’s music, and here again is another successful performance by Terrier. Closing up, “Sincerely, Planet Mom” is the piece that steers away most from the common denominator of this record, acquiring almost folk-rock colors with the incorporation of the violin and voice. A diverse, vibrant record that seduces the listener with its multiple points of interest, accomplishing several different nuances after repeated plays. I’ve had the privilege to work with Stephen Haynes over the past couple of years, playing with him and Joe Morris with various line-ups at Real Art Ways in Connecticut. This week, Stephen Haynes will be premiering his new project, Pomegranate: New Music for Bill Dixon at the Stone, 10pm. It is a real honor for me to play along side these music luminaries of the Avante-Garde. Yes I’m excited. Stephen will then take the group up to Connecticut in March and we will perform at Firehouse 12, recording the live show and then follow up with a studio recording the next day. help those in need and that resolves to extend equal rights to all. Marriage dress is all amuck. Hello Friends and Family! Some exciting news. 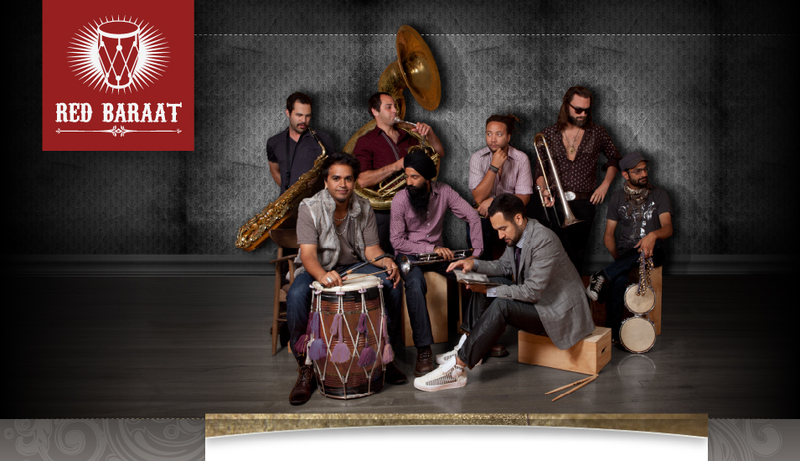 I’m excited to be playing with Red Baraat for tours in California and Germany for July. These guys put on a great show and are an amazing bunch of musicians. Bustin’ out the sousaphone for this one. Be sure to check out their website for getting tickets as well as the rest of the months schedule. The concept of Zozimos is basically a pool of musicians that I can call on to perform my music. Rather then limit myself to one band and one instrumentation, Zozimos has taken on many forms and played several different styles of my music. Zozimos first performed as a big band at the Tea Lounge, performing a group of pieces centered around the Hansel and Gretel fairy tale, then as a funkadelic Quartet playing at Cornelia Street, as a Brass ensemble playing contemporary chamber music at the Stone, as a sextet again at the Stone, as a 10 piece chamber ensemble performing Eight Houses, an I-Ching inspired hour long piece with a set form incorporating open-improvised music, and composed sections at Roulette, and as a quintet that you will hear predominately on this CD with some extended instrumentation. I decided to orchestrate several of the mixed ensemble pieces down to a quintet form to have a polished well rehearsed group present a survey of the past music. These pieces were written between 2008 and 2011 and final revisions to some were made up until the recording session. This CD is different from my debut CD, in that the forms are much longer, there is more written material, and aside from an arrangement of a tune from my first CD, the harmony is much more elaborate, stylized and uniform throughout. Working with Zozimos over the past 4 years, I was heavily invested in advancing my harmonic language. By the end of the CD I formulated my harmonic techniques into a treatise called “Micro-Functional Tonality,” but instead of publishing it, I decided a CD applying this technique/style would be more interesting then a paper on it. On this CD I wanted to play around with longer song forms and feature specific instruments. The tunes on this CD usually have one or two unifying motifs and several episodes that take the band and music through different musical ‘looking glasses’. compositional process, there are strange emotional factors that go into the final product. In the next couple of paragraphs I would like to just give a brief of overview of some techniques and how I used them in two pieces. My concept, Micro-Functional Tonality(MFT), technically speaking, is a way to suggest tonality without relying on any particular key. The keys change rapidly so there are no key signatures. Also, the technique never uses a V – I progressions in the context of a key. The idea is that this technique is able to propel a sense of forward harmonic motion with no dissonance and with no key center. It differs from Schoenberg’s roving harmonies in that is uses tritone chords sparingly seeking to create a sense of development without dissonant chords. It is easy to write chords that are intrinsically dissonant and find its logical resolution in any number of consonant chords, but it takes further investigation to find out how consonant chords interact with one another outside the realm of a key signature. Micro-Functional Tonality sees a major scale and key as a bi-product of 1st and 2nd degree MFT progressions. is probably the most academic of pieces in that it uses a very strict rhythmic drone, inspired by Messiaen’s isorhythms and also 3rd related harmonies inspired by Brahms primarily; but it is an 8 chord progression (using only major and minor chords) that harmonizes a twelve-tone imbedded melody. The isorhythm completes it cycle after 2 full cycles of the chord progression, the second cycle is done a tri-tone away. The chord progression is, like most of the CD an example of Micro-Functional Tonality. The actual melody heard above the chords that the guitar plays is a 3 note, intervalic motif that expands and contracts as the tune makes 2 full cycles. Gehry, Indiana’s name comes from how the harmonic and melodic contours rises and falls like some of the strange buildings of Frank Gehry. Also, at the time I began writing this piece, it was announced that Michael Jackson died. Even though I was concentrating on the piece, I couldn’t help but feel that something in this piece was inspired by my reaction to MJ’s death. It might be only a very abstract relation, but nevertheless… Suffice to say I was not able to finish this piece until just before the recording. The beginning triads are another examples of MFT but the real investigation this piece brought for me was unifying the form and at the same time allowing for seemingly disparate sections to exist. Theoretically these section where one and of the same, but audibly it took some ear bending to decipher the connection. The whole piece is in 3/4 but dotted quarter notes in the beginning give off a two feel that rubs against a 9/8 melody feel. In the end 3 bars of 3/4 fit over two bars of 7/8 and one 2/4 bar. The dotted chords note two feel comes in at the end in the drums to juxtapose the two rhythmic feels. is a little different vibe from the rest of the CD but it is episodic and narrative in nature. The song shows two sides of a mother. One is that of a mom being proud of her progeny, the other is that of mother earth discussing nature’s order. One is a bright energy full of excitement, the other is one of sublime destruction. They meet in the end joined by the idea of love. When the theme in this song comes back it does so over the septuplet “rock-out” section, maintaining the energy of the fast section throughout till the end of the recapitulation (where the voice comes back in). i believe the idea of a republican cynic is a necessary evil to keep government from creating overreaching inefficient bureaucracies, but with the current issues at stake and the extent of the cynicism, the idea of a republican cynic has become a powerful cancer that can’t find it own purpose, a robot that has gone rogue. they are great at doubting government and finding legislation that will silence the voice of the people so that the large corporations can maneuver with their lobbyists around government to create their ivory castles, but they are now in harms way with themselves, killing off their own relatives for the sake of greed. through the idea of the republican cynic, ivory castles will and do exists as the world is torn down around them. unfortunately, they are signing their own dismal fate and taking everyone else down with them. the purpose of our government is suppose to be for and by the people, not only those with money. in the last couple of decades, republicans have taught us to doubt government to the extent of destroying our own means for improving our standards of living. at this point we are arguing with the cancer of republican cynics to find ways to improving the state of our health care system. this shouldn’t be an argument, it should be a discussion that will benefit both sides. a republican is not a republican anymore, in the sense of helping to create a better government, it is part of a machine that will destroy the middle class and the poor, giving freedom and liberty to only those with money.